East of Nova Zembla is neatly frozen, fast ice on the coast of eurasia is getting packed, Bering sea is loosing some on concentration near the Alaska coast but the gap North/northeast of Spitsbergen is getting wider. East of Spitsbergen is fine. Baltic sea and White sea are only partly capped in ice. Windpatterns have changed and there has not been a stable Beaufort Gyre this winter, at least so far. I bet special forces from some private army like NATO have the best options/gear to last longest, better put some distance to you and places they operate, are housed and so on. Basicly all you need to have is the skill and knowledge of survival in the wild, find shelter, make fire, water and some food to make it through the winter. Dangerous for sure but less than staying in town. Have you confused me with onlooker? One of us should be insulted, question is which one. The ice chart you link to is typical for this day of the year especially when you consider Hudson bay being as completely frozen as it is. If the Beaufort Gyre is churning you wouldn't see it as it is under the ice and all that might show is some pressure ridges in the ice. I'm already out in the woods with all the tools and weapons I need for survival NATO troops notwithstanding. I thought the Gyre were a wind driven current, there is a graph on movement of ice, Paul B had a video on that, should be visable and possible to show the history/data of this winter. I bet a few lone wolf families are no concern for those special forces, no targets. Their drift velocity map is labeled average monthly. January averages would be much less then August numbers. But even then the green area 2 to 10 KM per day is understandable with wind speeds of 90kph. Given the distances involved an average 5km/day wouldn't give you more then one or two circuits a year so it isn't much of a gyre as far as the ice on the surface is concerned. Perhaps the water below the ice moves faster driven by thermosyphon forces. vtsnowedin wrote: Their drift velocity map is labeled average monthly. January averages would be much less then August numbers. But even then the green area 2 to 10 KM per day is understandable with wind speeds of 90kph. Given the distances involved an average 5km/day wouldn't give you more then one or two circuits a year so it isn't much of a gyre as far as the ice on the surface is concerned. Perhaps the water below the ice moves faster driven by thermosyphon forces. Thermosyphon forces? That sounds great I'm all ears for that one, hihi. Since the arctic ocean is very shallow underwater topography will probably effect currents a lot, transpolar drift and the like. Anyway, thanks for the info, maybe ESA does show direction, I think I missed it, would be strange if they let do not cover this, it is as important as speed. Is there average direction? Like 70% winds from the East or so…..hard to get that on the map. Allrighty then, learned a bit on thermosyphon, natural heat convection in liquids. Thermosiphon (or thermosyphon) is a method of passive heat exchange, based on natural convection, which circulates a fluid without the necessity of a mechanical pump. Thermosiphoning is used for circulation of liquids and volatile gases in heating and cooling applications such as heat pumps, water heaters, boilers and furnaces. Thermosiphoning also occurs across air temperature gradients such as those utilized in a wood fire chimney or solar chimney. This circulation can either be open-loop, as when the substance in a holding tank is passed in one direction via a heated transfer tube mounted at the bottom of the tank to a distribution point—even one mounted above the originating tank—or it can be a vertical closed-loop circuit with return to the original container. Its purpose is to simplify the transfer of liquid or gas while avoiding the cost and complexity of a conventional pump. Neat way to pump from A to B without hassle. Maybe not something new but old knowledge as in it worked like this last century, up until 2007 or so. Since humans first ventured into the ice-covered oceans, they knew that sea ice motion occurred on small scales, such as a few kilometers (a couple of miles). But it wasn't until the voyage of the Fram to the Arctic that scientists finally confirmed that sea ice also moves across large-scale regions, primarily from the wind. The wind-driven Arctic ice circulation pattern has two primary components. First, the Beaufort Gyre is a clockwise circulation (looking from above the North Pole) in the Beaufort Sea, north of Alaska. This circulation results from an average high-pressure system that spawns winds over the region. A second component is the Transpolar Drift Stream, where ice moves from the Siberian coast of Russia across the Arctic basin, exiting into the North Atlantic off the east coast of Greenland. Sea ice that forms or becomes trapped in the Beaufort Gyre may circulate around the Arctic for several years. Sea ice that forms or becomes trapped in the Transpolar Drift Stream generally leaves the Arctic more quickly, usually in one to two years. Because of this, sea ice in the Beaufort Sea has more time to grow and reach the thermodynamic equilibrium thickness, so it is thicker. Also, because of the circular rotation of ice in the Beaufort Sea, ice floes frequently bump into each other. Ice deformation is common and leads to thicker and more ridged ice compared to other regions. The Transpolar Drift Stream pushes some ice against northern Greenland and the Canadian Archipelago; the ice compresses and deforms into ridges, resulting in the thickest ice in the Arctic. Plot showing mean (average) Arctic ice motion from 1978 to 2003. Arrows show the direction and velocity of the ice, with longer arrows representing higher velocities. In both the Beaufort Gyre and Transpolar Drift Stream, most of the ice follows a large-scale pattern when considered over a long period of time; however, within this long-term pattern of movement, there can be a great deal of variation. For example, the Beaufort Gyre may completely reverse directions--and often does for short periods of time, such as after a storm from a low-pressure system that moves across the region. Likewise, the Transpolar Drift Stream may also reverse direction. The day-to-day variation in the large-scale circulation can be quite dramatic. So I am looking for recent average maps, say 2010 or even 2015 to now. You can clearly see how the Barentz sea has been Atlantified lately, ice used to drift close to the Norwegian North, the cape. Last edited by Whitefang on Thu 31 Jan 2019, 06:51:55, edited 1 time in total. Some of the red (fast) arrows are drawn long enough to show direction.Perhaps at the right scale the green arrows do as well. There is a rotation around the Beaufort gyre and a tendency to move away from the Russian coast over the pole and piling up in the Canadian archipelago and the north coast of Greenland. A few winters ago you could access weather buoys they had dropped on the ice and see their drift track as well as the weather data from their current location. It takes a couple of years to get from the east Siberian sea to the Denmark strait. I've lost the location of that website or perhaps it has been pulled down but here is a map. Found one of them again. Notice the sixty day tracks and how few of them have moved very far. Last edited by vtsnowedin on Thu 31 Jan 2019, 07:03:56, edited 1 time in total. Right on VT, it does show direction on the maps, thanks. So in theory with all the abrupt changes it should show up on these maps but it will be difficult to filter out the variations. No sea ice will def.change everything! Like the Barentz sea going blank. This complex circulation system in the Arctic—which impacts the entire food web—is in a delicate balance. In recent years, scientists have documented changes in the Arctic system, including a dramtatic reduction in sea ice cover and a weakening of the Beaufort Gyre circulation system, that are attributed to climate change. The Arctic Ocean affects the way of life of not only the Arctic native peoples, but also those of us living “downstream,” in Europe and North America. As such, the Arctic Ocean, and the effect of changes that are taking place there, are the focus of intense study by oceanographers of all disciplines. Whitefang wrote: Right on VT, it does show direction on the maps, thanks. The Barents sea has always iced out every summer being at the receiving end of the Gulf stream warm current. It is how early the ice retreats north and the number of days and total area of ice free water that is the concern. I would say so, a concern as the whole Barents sea has yet to freeze, except for a thin stretch along the Russian coast. Hotspot sea temperature west of Spitsbergen makes ice hard to get a hold on, affecting, heating the atmosphere of a vast part of the Barentz sea/northern atlantic. Winter is not done yet but after March the sun will rise again at those Northern Latitudes and its game over for local sea ice, period. The ice movement looks very erratic, it is harder than I thought to see changes neatly spread out in the data maps and graphics. Thanks for bearing with me and finding out more on the puzzling arctic, that white mysterious madness that covers our globe, for now protecting us from being thrown into the accelerated part of abrupt CC. The other factor seems to be GD, Global Dimming, when we loose that shield, like the albido and so on....we will be toast in no time, well, years still but not decades. With methane already going strong, it think it is either loss of sea ice or loss of dimming that will release the brakes on Global Warming. These guys and the occasional girl use the median ice edge 1981-2010, already including the tipping point of 2007. We do have 2 months of winter to go, so room to grow. Linky from last year, arctic sea ice 2018. Maybe we will have two wedges, blue warm storms from the Bering, moving South, east of Greenland, or joining with the heat from the Atlantic, now flowing past the Scandinavian mtn ridge. At some point the heat from the Pacific will meet the Atlantic side, Atlantic Rising, a love affair. The cold is twisted into a giant S, Greenland is a bridge, weak link the sea ice on the ocean up North. It is bound to collapse, I used to think that the warm pacific air would not pass Alaska/East Siberia, for the various mtn ranges and narrow inlet, Bering strait, I were wrong, again. 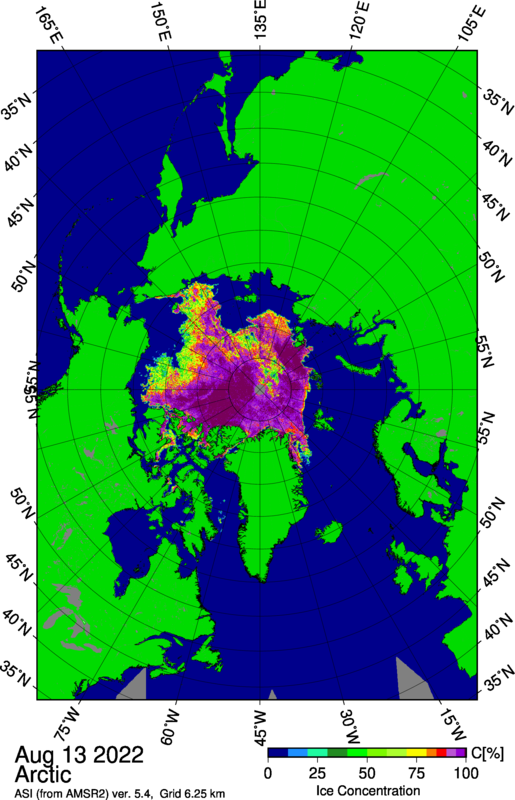 Couldn't find the 2019 thread for Arctic sea ice. A little surprising but then again not, as 2019 sea ice is on pace to be the largest in extent in the last 5 years and nipping at the heels of 2013. What are you looking at? This is what I got from your link. Newfie wrote: What are you looking at? This is what I got from your link. In the legend on the right hand side, click on a year to remove or add a curve to the graph. Then compare this year to any of the previous years or to the averages. This years ice extent is up compared to the same date of the previous 5 years. Same previous years, OK. But if you look at the rest of the chart you will see the part that shows us below the 1991-2000 average. If we went back further you would see an even greater difference. So yes, we may have a slight uptick over the last 5 years at this instant. But the 30+ year trend shows a difinitive decline. I look at it as a slight break from the downward trend. It might be a one year anomaly or just a slight redirection of the trend line. A good thing either way but a small thing against the last decades results. I do like monitoring the arctic ice extent. It is an unbiased source not effected by who is funding the study. You do have to look at the pictures for yourself from time to time as all the reporting is funded by people with a mission and a funding source to protect. Elsewhere incame upon this facinating article. It clearly shows how some are trying to skew the data to prove AWG does not exist. Newfie wrote: Elsewhere incame upon this facinating article. It clearly shows how some are trying to skew the data to prove AWG does not exist. I have seen that sort of cherry picking of data over and over again from both sides of the debate. I think the skewing is by Tamino. The data says this year is the most ice extent at this time of year in the last five years, that’s the data. Skewing the data is to say but but but it’s not as great as the cherry picked average of 1981-2010, when the true average would be all the data, 1979-2018 right?